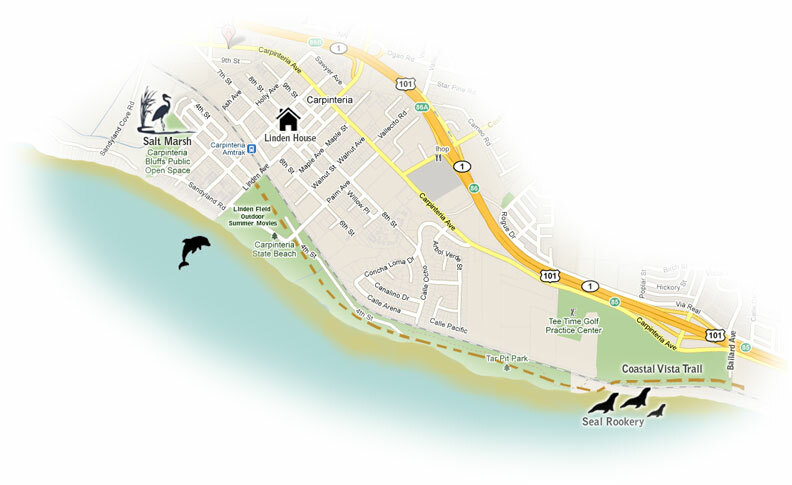 The Carpinteria Salt Marsh Nature Park, 110 acres of prime ocean front land, is home to many rare and endangered plants and birds. It provides sanctuary for close to 200 bird species, including many endangered species such as the Salt Marsh Bird's-beak, the Light-footed Clapper Rail, and Belding's Savannah sparrow. Of all the ways to experience nature in Carpinteria, a docent-led or self-led tour of the Salt Marsh Nature Park is perhaps the most rewarding. Free docent led tours every Saturday @ 10 am. The entrance is along AshAvenue across the street from the Solimar Sands condominiums. The short looping trail includes plaques and educational markers. Carpinteria Salt Water Nature Park. The NRS’s Carpinteria Salt Marsh Reserve and the Carpinteria Salt Marsh Restoration Partners have been awarded the Coastal America Partnership Award, the only environmental award of its kind given by the White House. The award honors all of the partners involved in rescuing the 230-acre marsh from encroaching development and restoring its ecological viability. In his letter of congratulations, President Barack Obama noted that: “The project demonstrates how diverse partners can come together to conserve and restore important coastal habitat. Along the way, funding partners also created green jobs by consulting with expert scientists and engineers, and tapping the talents of local contractors, restoration specialists, and native plant nurseries.